United special is as the name suggests special type of united events where you can participate in quick or standard speed united competitions (united leagues, cups and tournaments). 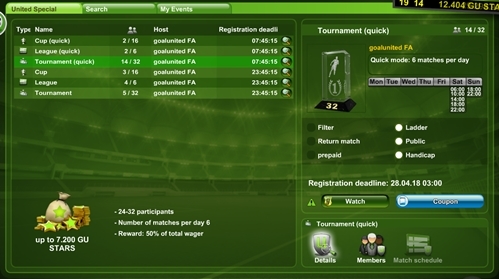 Each united special event is organized by the "goalunited FA" and the final winner will always receive GU STARS reward from these events. GU STARS rewards for united special events are predetermined prior to the start of the each competition. You can find united special events right from the home page after you logged in or you can go to main menu option "United -> Lounge -> tab United special".